A once minor sector has seen a mass popularity boost, with the Samsung Galaxy Note 3, Sony Xperia Z Ultra and HTC One Max leading the charge of high-specced, big-screened devices. So, does the Nokia Lumia 1520 have what it takes to match up against these literal mobile phone heavyweights? Read on to find out. Right, first things first - this is a big phone. A really big phone in fact. It's definitely, as much as we hate using the word, a phablet. But, really, if you're even contemplating making this phone as your daily driver then you know that already, and you're fine with it. The device that really kicked off our love/hate relationship with these phone and tablet hybrids was the Samsung Galaxy Note, and the latest iteration of that product, the Samsung Galaxy Note 3, is the biggest competitor to the Nokia 1520. In size terms, both these phones are pretty big, the Samsung Galaxy Note 3 comes in at 168g and 151.2 x 79.2 x 8.3 mm, while Nokia's 1520 measures 162.8 x 85.4 x 8.7 mm, with a weight of 209g. With the larger weight and bigger dimensions comes a phone that is sometimes quite awkward to hold, requiring two-hand operation practically all the time. If you're someone who wears a lot of skinny jeans, or even slim-fitting trousers, the Nokia Lumia 1520 will protrude from your pocket. Those niggles aside, the phone itself is beautiful. The smooth matte back is a joy to hold, with the slight curves fitting the contours of your palms perfectly. Each of the side-mounted buttons feel solid, giving a firm click when pressed and the speaker grilles are cut with utmost precision. Unlike on the Nokia Lumia 1020, there's no big hump for the camera, just a slight ripple, with the flash placed directly above. A Micro-USB port sits on the bottom, while the power button is placed on the side - a must for a phone of the size. Nokia has made colourful phones one of its trademark design choices, with the Lumia 1520 coming in yellow, red, white and black. Our review model was yellow, a bright burst of sunshine that really stands out. We were less enamoured with the red model, which ditches the matte coating for a glossy one and looks much cheaper for it. 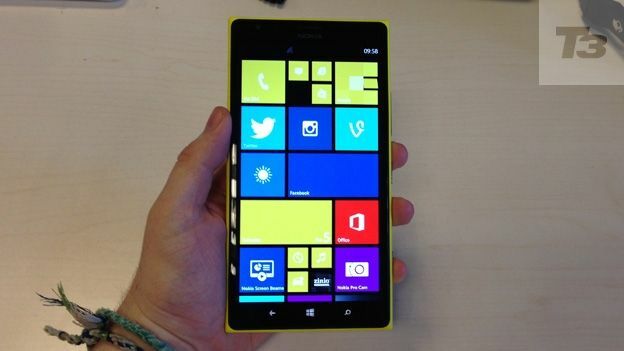 The Nokia Lumia 1520 comes running Windows Phone 8, though it is the latest version that supports an extra row of tiles. You can now cram a ton of always moving and updating Live Tiles on your home screen, giving you glancable information. Windows 8 has come a long way, even in the past months we've seen the arrival of dedicated Vine and Instagram apps, finally halting those constant cries of "I couldn't possibly buy a Windows Phone as it doesn't have Instagram". While Instagram is available to download, it is nowhere near as feature rich as its Android and iOS counterparts. Video is lacking and it just doesn't feel particularly polished. The main gripe we have with the software on this device is that it just doesn't take advantage of all that screen real estate. Yes, you get a few extra tiles, a few more entries in the calendar and a couple more contacts in the address book, but nothing that will really change the way you use your phone. The Samsung Galaxy Note 3 included a fantastic stylus, a load of neat features that worked with it and just a lot of big screen optimisation. Nothing like that has been included here. Instead, everything is just bigger - from icons and text boxes and in some apps, like Twitter, bigger just looks worse. A few nice Nokia tweaks are onboard - we really love the double tap on the screen to wake the phone from sleep and the always-on clock is handy as well. There's also Nokia Retouch, which is like a software-based Lytro camera - simply take a picture and focus your shot afterwards. It's quirky, works well but not having it built into the main camera app means you'll probably never use it. As with all the other high-end phones, there's LTE support, Bluetooth and the like, along with Windows classics like Xbox Music, Microsoft Office and Xbox games. Call quality is also very impressive - with conversations coming across crisp and clear and with minimal distortion. Headlining the Nokia 1520 is the display, and wow, what a display it is. The 6-inch, full 1080p panel is rich, detailed and fantastic at accurately representing colours. Blacks are deep and inky, bright shades pop and watching HD video on Netflix is surprisingly immersive. This is the first 1080p Windows Phone and the OS really takes advantage of it. Live Tiles look great, with no visible pixels and thanks to the high resolution, a lot of info can fill one tile. As the display is LCD, viewing angles are superb and you can move to ridiculous angles and still clearly see the display. Coating the screen is Gorilla Glass 2, so scratches should be a bit less common - we still wouldn't advise you leave it in your pocket jangling around with keys. Nokia has been pushing phone camera tech for a few years now, from the Nokia 808 PureView to the the Lumia 1020, boasting a 41-megapixel snapper and the Lumia 925 taking possibly the best shots from a slim device. The Nokia Lumia 1520 packs a PureView camera, with 20mp and Carl Zeiss optics. There's also 1080p video, f/2.4 aperture and a very decent Dual LED flash. It's not just a specced-up camera that helps the phone snap great, detailed and bright shots, but also the Pro Cam software. This lets you alter everything from white balance, to ISO and exposure, all in a well-designed app that is surprisingly easy to get to grips with. Not all is great about the camera though, for one, it's pretty slow. Opening the app leaves you with a few seconds of black, just enough to miss that incredible shot you were shaping up in your mind. Compared to the iPhone 5s, which has a camera app that opens almost instantly, the Nokia Lumia 1520 dawdles. Snapping shots in quick succession is also frustrating, taking an increasing amount of time to save each time. But, in the end, you'll be left with great photos, and really that's mostly what matters. Packing a Qualcomm 800 2.2 GHz quad-core processor, with 2GB RAM, 32GB internal storage and expandable, Micro SD card support for up to 64GB, this is real souped-up smartphone. Given that even on relatively low hardware Windows Phone 8 performs admirably (the Nokia Lumia 625 is a great example), barely ever stuttering or producing lag, it's no surprise that the Nokia Lumia 1520 is a real king of speed. Navigating the menus, swiping through sites and playing games (the few that are available) is a smooth and quick experience, one where lag never comes into the equation. It sort of seems this amount of power is a slight overload. There are just not enough powerful apps to take advantage of these specs. It's frustrating, knowing you have all this oomph at your disposal, yet nothing to really use it to its full potential. With a big phone, comes an equally big battery, though it's actually not that impressive. During our testing we could happily go through a full day, though anymore than that and you'll be running on fumes. It definitely isn't as good as the Samsung Galaxy Note 3. Standby time was good though, leaving the phone untouched over night saw only a small drop in percentage. There's a lot to love about the Nokia Lumia 1520, from the gorgeous display, to the precision-designed shell and the fantastic photos taken by the camera. Yet, it just doesn't use the full potential of having 6 inches of screen to play with - making everything bigger is simply not a solution. We'd have loved to see a stylus, or something unique that you wouldn't get on a regular-sized device, but, sadly, nothing like that is here. Our gripes with Windows Phone 8 are lessening, that's for sure, but it's still a fair way behind Android 4.4 Kit Kat in terms of overall design, functionality and app compatibility. Yes, Instagram is here, but it's not the same experience as we're used to and developers just don't seem to have that urge to keep their apps updated. For the most part, the phone breezes, except in the camera - one place where time is really of the essence. We do like the Nokia Lumia 1520, but it needs more and who knows if Nokia will have the chance again to right the wrongs?